I am shocked at the cost of Halloween decorations at Michaels, and even at Walmart these days. Plastic or foam ghosts cost more than dinner at a not-too-shabby restaurant, which is insane. So I’m on a quest this year, even more than I usually am, to make more for less this Halloween. Enter the Gourdly Ghost, or the Ghostly Gourd, whichever you prefer. Gourds are plentiful at this time of year and that means they are readily available for bargain prices. Or you may already have dried gourds from last year’s garden to make this project. If so, give yourself a high five and do a happy dance because a dried gourd is perfect for this. 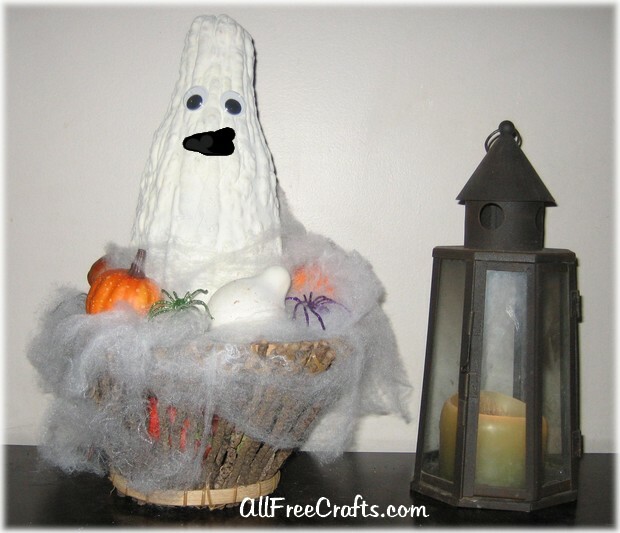 Also on this page: how to make one or more gourd ghosts into the focus point of a simple Halloween centerpiece. Paint the gourd white, either with white acrylic paint and a paint brush or, alternatively, white spray paint. Let the paint dry and apply a second coat for complete coverage. Use the permanent marker to draw a black mouth, centered below the eyes. Depending on the size and shape of your basket, you might find it useful to loosely pack the bottom with crumpled newspaper, easter grass or whatever you have available to support the decorations. Position the ghost gourd in the center of the basket and surround it with miniature pumpkins and gourds, using the smaller decorations to help prop up and balance the larger ghost. Spread wisps of spider web over and around the pumpkins and the little gourds, giving the impression that the large ghost gourd is rising out of the fog. To finish, add a two or three spiders evenly spaced around the spider web.